Reading and share top 2 famous quotes and sayings about Tanngnost by famous authors and people. Browse top 2 famous quotes and sayings about Tanngnost by most favorite authors. 1. "Peter didn't answer. He pulled his legs up to his chest, wrapped his arms around them, and put his chin on his knees. Ever the contradiction, Tanngnost thought. One moment a cold-hearted killer, the next a sentimental boy, always the eternal optimist despite a lifetime of tragedy. Of course, that's his glamour. The very thing that draws the children to him, makes them love him despite so many contradictions. 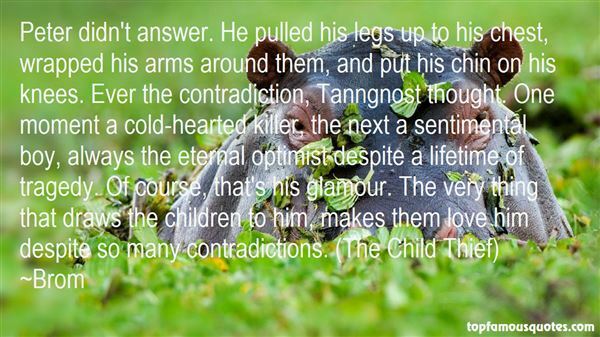 (The Child Thief)"
2. 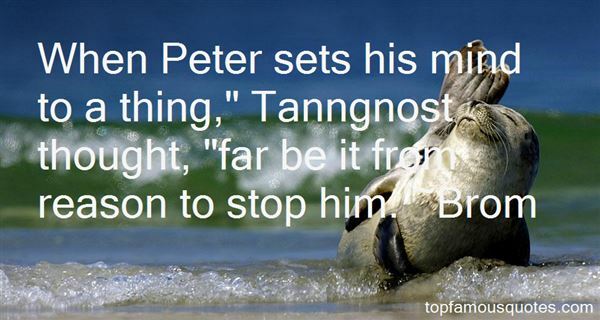 "When Peter sets his mind to a thing," Tanngnost thought, "far be it from reason to stop him." It's only a sure defeat when you stop trying."